There is no question about it; college is expensive and college tuition keeps increasing. But who ends up owing more in student loans? Poor black students, according to a new research published last week by Children and Youth Services Review. According to College Board, the average cost of tuition and fees for the 2015-2016 school years was $32,405 at private colleges, $9,410 for in-state residents in public universities and colleges, and $23,893 for out-of-state students attending public universities. Most students, especially low-income students, don't have enough to pay for college so they end up owing on their college loans well past graduation. 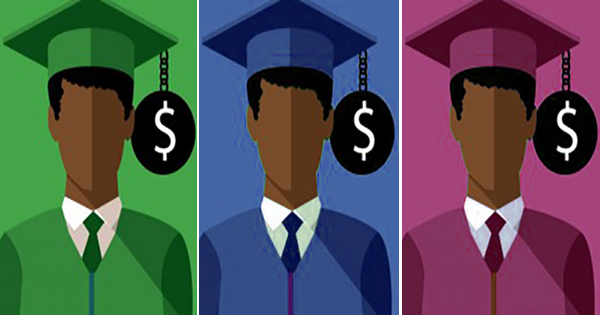 According to the research, blacks and lower-income students are the ones who are accumulating more in debt than their white and upper-income peers. #1 - Culture: Even though most students come from similarly low or moderate income families, white and Asian students may be able to count on greater economic support from their families than can black students. In Asian culture, for example, parents start saving for college when their children are just babies. #2 - Less Help From Parents: One study concluded that black students receive less help paying for schooling from parents, than do white students in the same income groups. This again may be cultural. For example, in many African American households, parents encourage their children to become more independent after the age of 18. #3 - Bad Choice of School: The college or university that the Black students attends makes a huge difference in how much debt they will accumulate. In particular, blacks and Hispanic students from lower-income families “are more likely to attend for-profit schools, which are poor value for money by comparison to state schools and other colleges." According to a recent U.S. News & World Report article, 90 percent of students graduating from for-profit schools have education debt. Although for-profit schools often give poor students a chance they otherwise would not have to attend college, for-profit schools have had a reputation of encouraging students to take out loans to pay for their tuition. In addition, their tuition is usually higher, which means students need to borrow more.